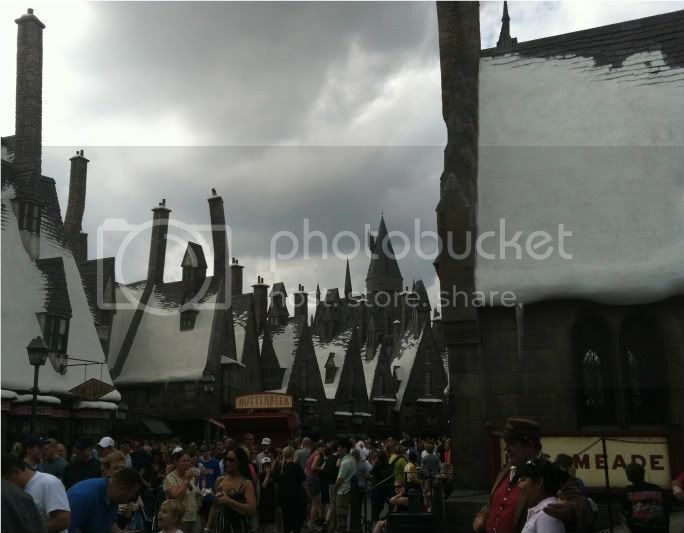 Last weekend I went to The Wizarding World of Harry Potter at the Universal Islands of Adventure in Orlando. 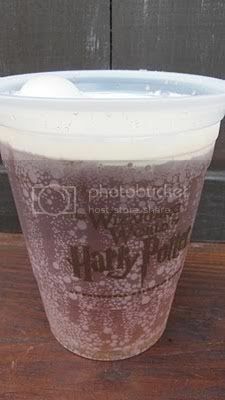 I went on a few rides, explored Hogsmeade and sampled the butterbeer. What a fantastic mini-vacation. The park really did a phenomenal job of bringing the whole world to life. It was awesome! Upon first entering the park, attendants take your fingerprint, which seemed a little creepy... but the reason become clear, when I found that the free lockers (for storing your bag and other items when going on turbulent rides) are opened and closed using your fingerprint scan. The scan also prevents park tickets from being stolen or transferred. The park was broken into several different themed "Islands" of which Harry Potter was one. 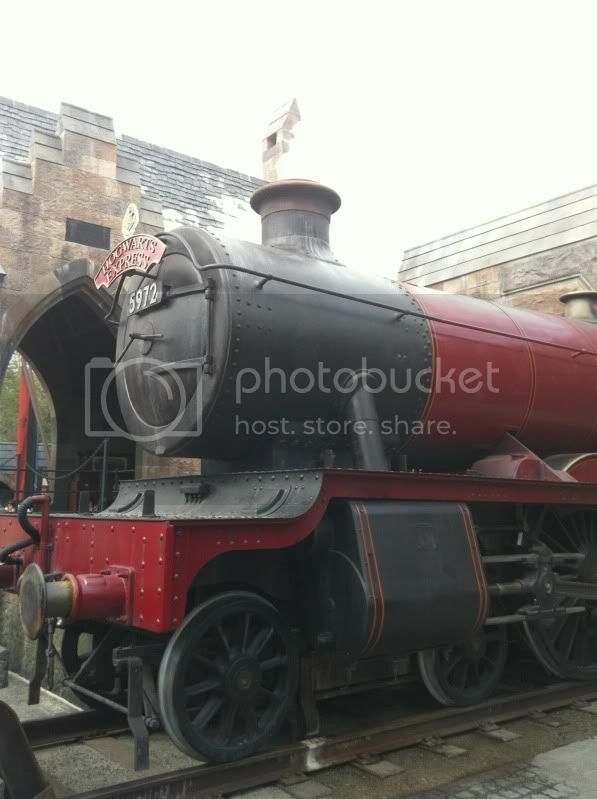 Entering that section, the first thing you encounter is the Hogwarts Express with signs for Platform 9 ¾. The whole street was laid out with plenty of attention to detail. You can even mail a postcard from the park, and they'll postmark it, "Hogsmeade"
The Harry Potter portion of the park was actually quite small... just three rides, plus the street for shopping. Obviously, I wanted to see the main attraction first... 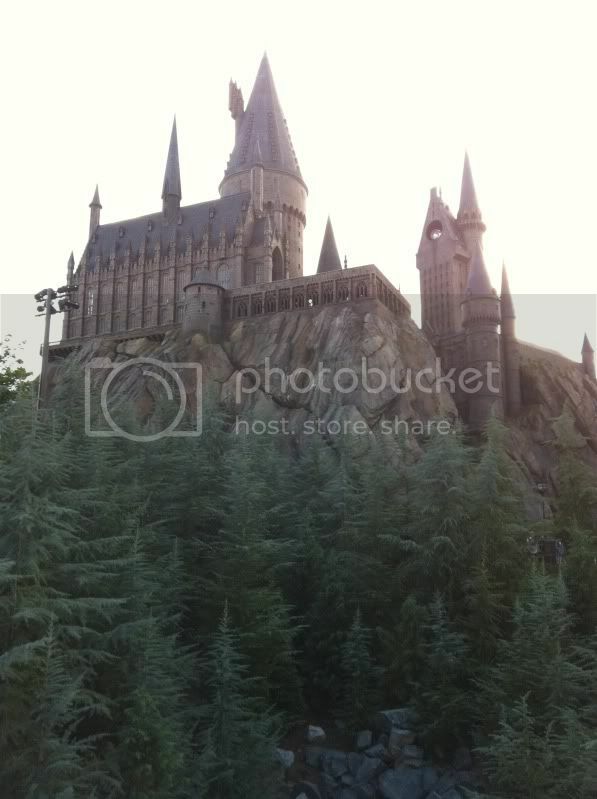 I headed straight up to wait in line for the Forbidden Journey ride at Hogwarts Castle. We're all familiar with this sign: You must be this tall to ride. But, I found another sign throughout the park, a sad testament to America's weight problem. The full text reads, "Notice from the Department of Magical Transportation. Test This Seat Before Riding. The attraction's seat restraints may not accommodate guests with certain body dimensions. Please use this test seat to ensure your ability to ride." I guess this is to spare overweight park-goers the embarrassment of being asked to leave without riding if they prove too fat to fit in the seat. The line for the Harry Potter ride reminded me of the Indiana Jones or Star Wars lines at Disney, in that they've attempted to make waiting in line as fun as possible. Mercifully, most of the time spent waiting was in the shady covered greenhouse just outside the castle. Once inside, you pass through several rooms, with a few special effects. The Portraits Hall, including the Fat Lady who guards the entrance to Gryffindor's section, Dumbledore's office (his pensieve is close enough to touch), and the Defense Against the Dark Arts classroom are probably the most memorable. As you enter, the Sorting Hat gives some instructions. The actual ride is a motion generator which combines animatronics with full screen flying experiences. The first portion of the ride, I really enjoyed... you are flying to meet up at a Quidditch match, soaring over the towers of Hogwarts, when you are attacked by a dragon. An animatronic dragon roars hotly at you, causing you to fly into the Forbidden Forest which is full of spiders. This was the part where I was ready for the ride to end. I was so afraid that they might dangle string or somesuch to simulate a crawling sensation, I shrank into my seat in fear for the rest of the ride. Unfortunately, there was a lot more flying, swooping, falling and whatnot before the ride was over. When the ride finally ended, I stepped off into the giftshop where they'll post pictures of you on the ride. My companions were all smiling, "thumbs-up" and clearly enjoying themselves. I, on the other hand, had the most ridiculously terrified expression that one can imagine. Words fail me. I can't express how miserably craven I looked. I kind of wish that I had bought a copy of the picture, because it's so over-the-top. But, I wasn't willing to pay $29.95 or however much it was for such a thoroughly unflattering photo of myself. Ah well, perhaps it's for the best. After that, I decided to steady my nerves with some butterbeer. It was quite good! I had been expecting something a little more exotic... more alien, and British tasting i.e, not incredibly delicious. It was a very, very sweet, non-alchoholic beverage. Basically, if you took a cream soda and added just a drop of butterscotch flavoring, I think you'd have it. Next, I tried the much tamer Flight of the Hippogriff, a kiddie coaster, decorated in a wicker motif, with a few drops and sharp turns, but no upside down movement. 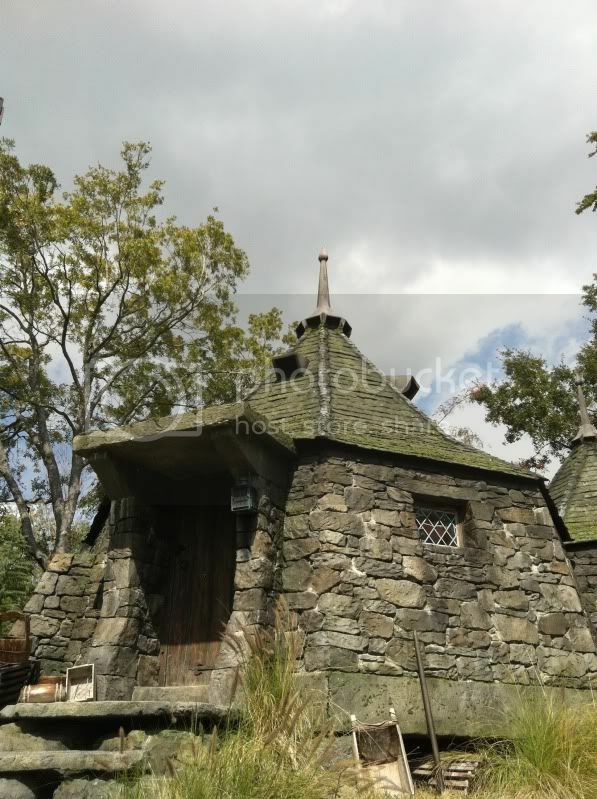 Just outside the ride is Hagrid's shack, where you can hear mysterious growling noises, and a bemused Hagrid trying to calm the creature. There's a third ride, The Dragon's Challenge, a more intense roller coaster, which after my spectacular show of cowardice on the Forbidden Journey ride, I decided to skip. So, then it was on to do some shopping! As I mentioned before, not a single detail was overlooked on the entire street, and by this point the crowds were really in full force. There were lines to get into the stores. But, when you see how amazing they looked, perhaps you'll understand why. 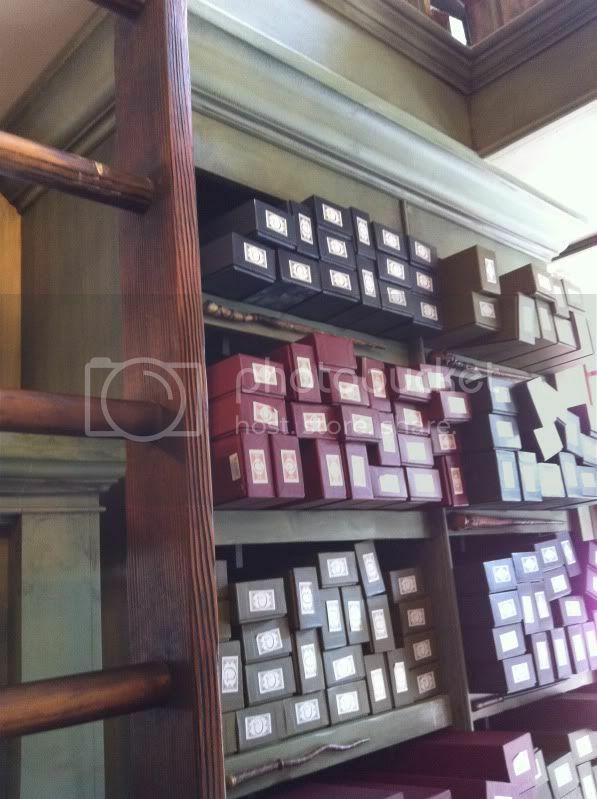 The longest line was for Ollivander's Wand Shop. 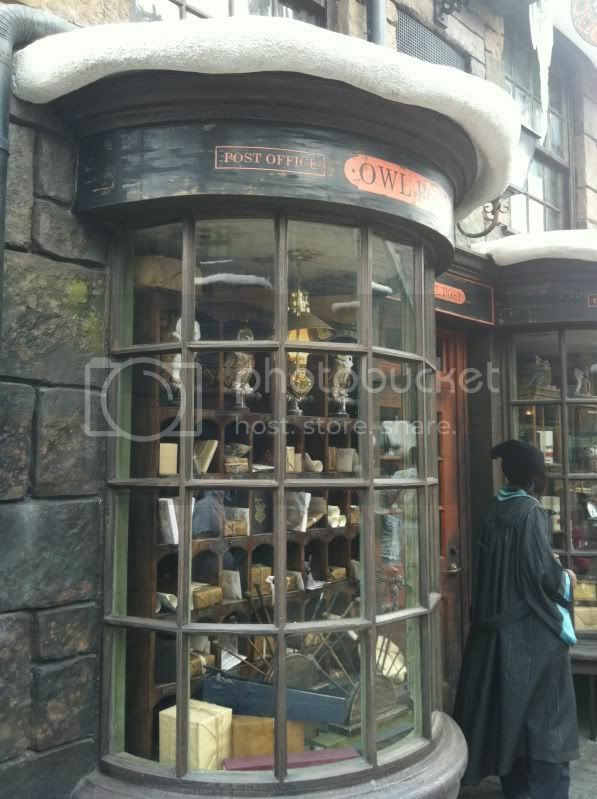 They had all these beautiful boxes of wands, many of them reproductions from the movies, but many original ones as well. 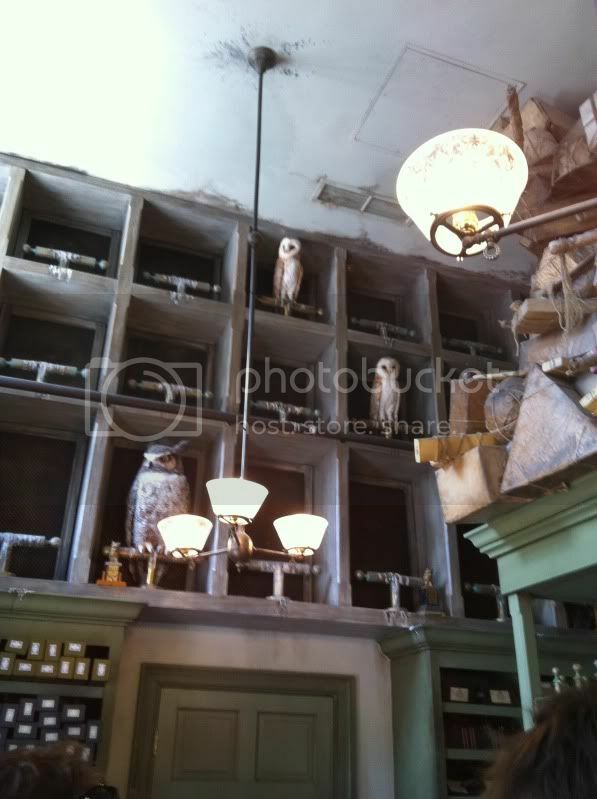 They even had a wall of animatronic owls and "overstock" of wands piled to the ceiling. 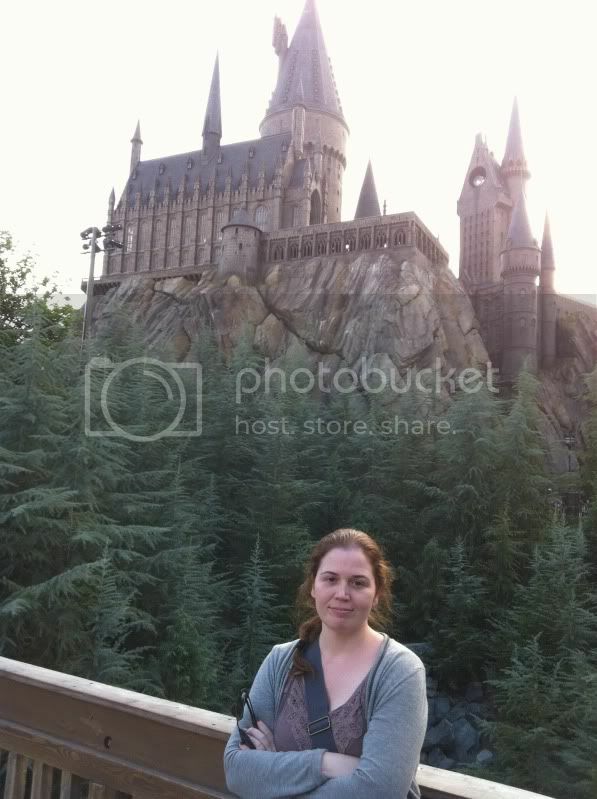 Here's a picture of me, in front of Hogwarts during a less panicked moment. The whole experience was really neat! I would definitely go again. SO COOL! I would love to be able to visit, it looks amazing! That sign about testing the seats is a bit depressing though, kind of like when Disney had to re-do the "It's a Small World" ride because people couldn't squeeze into the smaller seats anymore. Just drive by blogging today, and my wheels stopped here. Great site! I'm extremely jealous! I want to go so bad! I wonder if it will always be this crowded, or if maybe it will calm down a little later. I know Disneyworld has always been crowded every time I've been. @Jenny Wow, I had no idea that's why the Small World ride was revamped. That's crazy! @Lisa It was crowded, but it was a busy Saturday in February. I think visiting during an offpeak time (say a weekday in November) would result in much less crowds. I wasn't shocked or displeased by the size of the crowds since I pretty much expected it... it was busy but not the worst I've ever seen. Haha, I really want to go, but I haven't yet. It seems like you had a ton of fun! Thanks for all of the wonderful pictures! We have been to the park three times since Harry Potter opened and that part of the park is ALWAYS busy. If the rest of Islands of Adventure is deserted, it's because everybody is in Harry Potter. We still have not been on the Harry Potter ride because the wait is just always too long when you have two small kids. My husband and I plan to get on it one day.... Great Pictures! Thanks for sharing! I am hoping to go there at the end of the month!